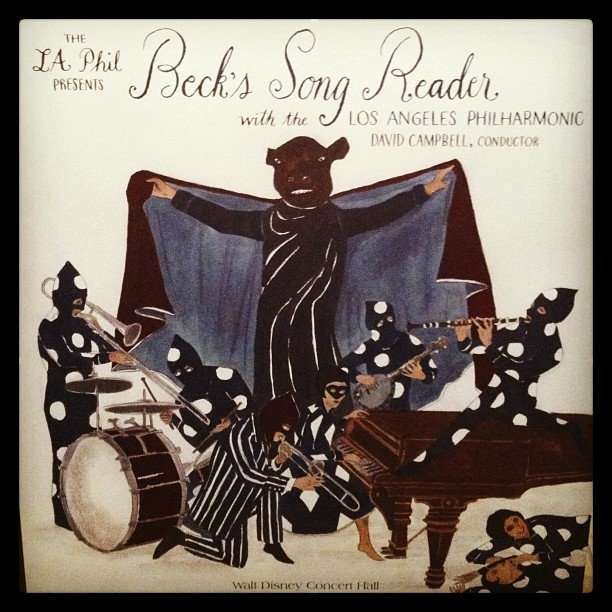 This was the LA Song Reader event, the third official show that Beck has participated in. The highlight (and difference) was for the entirety of the show, the LA Philharmonic (conducted by Beck's dad, David Campbell) backed all the singers. In between singers, various people gave readings about music and LA. Beck played "America, Here's My Boy" by himself on acoustic guitar (no orchestra) and then came out and premiered "Wave" from the just-announced Morning Phase with the orchestra. He then closed out the show with a version of "Heaven's Ladder" with the orchestra (and Roger on the GIANT church organ that is part of the Disney Hall's architecture). After that, Beck led off a giant singalong of "Do We? We Do" with many of the night's performers singing a line or two. 2. Merry Clayton & Fred Martin choir "Eyes That Say I Love You"
4. LA Philharmonic "Last Polka"
5. Childish Gambino & Roger Joseph Manning Jr. "Please Leave A Light On"
7. Jon Brion "Just Noise"
8. Moses Sumney "Title Of This Song"
10. Jarvis Cocker "Why Did You Make Me Care?" 11. Christian Robinson film on "what is music"
18. Jenny Lewis & Anne Hathaway "Last Night You Were A Dream"
19. Jack Black & Jonny Dyas "We All Wear Cloaks"
20. Tig Notaro on "You Can't Always Get What You Want"
21. Beck & Roger Joseph Manning Jr & Fred Martin choir "Heaven's Ladder"
22. Beck, Roger Joseph Manning Jr, Jon Brion, John C. Reilly, Merry Clayton, Jack Black, Childish Gambino, Jon Brion, Anne Hathaway, Jenny Lewis, Jarvis Cocker, Tom Brousseau "Do We? We Do"
Organ: Roger Joseph Manning Jr.